As the smoke clears from Sunday morning’s heinous radical Islamic terrorist attack in Orlando, debate goes on in conservative circles as to how to react to the ongoing threat from ISIS-inspired Muslims in America and also how to treat Republican nominee Donald Trump as a result of it. It’s safe to say the vast majority of Republicans and conservatives recognize that in the presidential race’s two-person contest, Trump is clearly superior to Hillary Clinton on the subject. But there are still holdouts in the #NeverTrump universe. It seems despite all the blood and the perpetrator’s obvious connection to Islamic radicalism overseas, nothing’s changed in #NeverTrump’s Neverland. After titling his daily piece “This is not a game,” Steve Berman of The Resurgent begins by correctly critiquing and scorning Obama and the left’s kneejerk gun control response to the murders. Good, I’m thinking, at least the #NeverTrumpers are starting to get it. Then Berman entered Neverland. Shortly after calling Trump a “jackass” and questioning the future effectiveness of The Donald’s proposal to temporarily halt Muslim immigration, Berman concludes, “We cannot elect a president in 2016 who plays games with terror. Unfortunately, both parties’ voters have proffered candidates who are exactly the opposite of what the country needs, either of whom will result in disaster for America. Playing games? Who are the ones playing games? Alas, #NeverTrump has finally made the jump from delusion to fantasy. Delusion because they still maintain there’s going to be some sort of “savior” swooping in to kick Trump out of the Republican nominee’s chair and fantasy because of their perpetual dreaming that one person even exists to magically solve this incredibly complex issue. Is that one man Mitt Romney? How about David French? If fellow Resurgent writer Erick Erickson is to be believed, they’d like to put Scott Walker in Trump’s place. Does Walker have a better terrorism solution than Trump? Is Walker more capable to make the decisions than Trump? Am I missing something here? Ever since Trump all-but clinched the Republican nomination after the Indiana primary six weeks ago, I’ve looked on with some parts amusement and some parts frustration at #NeverTrump’s pointed mission to persuade people to abandon Trump and either vote third-party or not vote at all. As I’ve said repeatedly, their basic purpose for exiting is to beg Americans not to participate in the process, because most of them insist they are #NeverHillary as well. But when critical events occur right outside of their own neatly framed naïve political window, it just could be time to rise up and recognize that ONE of the two major party candidates IS GOING to be president. Trump’s accepting of “congratulations” from his Twitter followers for being right in predicting more terrorist attacks do not make him a jackass. It makes him right. Trump’s reaction might not be the most humble thing in the world, but a fact is a fact is a fact. And Trump’s 100% correct in calling for a temporary halt on Muslim immigration until the elected representatives of this country do their jobs and legislate a set of rules for determining who gets in to America and who must stay out for reasonable fear they might be a threat to the citizens living here. Consider this: Hypothetically speaking, if mass immigration from the Soviet Union after World War II had resulted in numerous treasonous spies being caught from within the population, would we have let in millions more? What if some of those immigrants had committed numerous acts of terrorism? I think we all know the answer. The America of the 50’s and 60’s would have gotten to the bottom of the problem and at the very least stopped making it worse. In the politically correct twenty-first century, however, we have the Left screaming about the need for more gun control and their effective enablers on the conservative side (#NeverTrump) calling for a fantasy White Knight candidate to magically materialize to save us all. The Left is just a collection of nuts driven by an agenda. The #NeverTrump crowd lives in a fantasy parallel universe. Let’s call it Neverland. If I didn’t know any better, I would say Neverland is the command center for the #NeverTrump movement. Hearing them whine and complain for the past several months has been entertaining at times, but when we’re dealing with the intensely serious matter of homeland security – and the immigration and enforcement issues that go along with it – then it ceases to be funny anymore. I think it’s about time we walked out of this movie, folks. 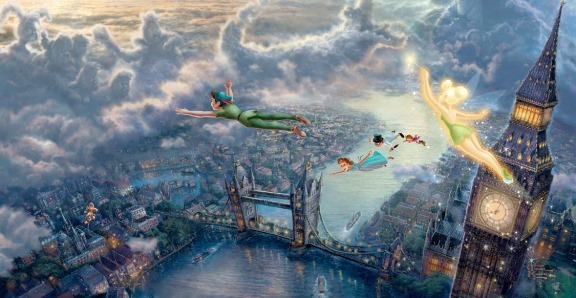 Neverland has to be shut down. Now that we’ve established Neverland is the command center for Republican elites and the #NeverTrump gang, their response to Trump’s reaction to the Orlando attack was almost as predictable as that from Obama and the gun hating Left. Gingrich is right. Lashing out at Trump for his comments in the aftermath of Orlando is just plain stupid and motivated solely by those trying to score political points and stir up more media controversy on Trump at the same time. Trump’s Mexican judge comments have been blasted off the front page now, so the Trump haters are just looking for something else to pin on him. Enter Trump’s tweets. Only on this matter, most of America would agree Trump was right on target, so who’s going to be the next one to call him racist or some other false label to discredit him? Instead of attacking Trump, wouldn’t these people be better off focusing on the absurd positions of Obama and Hillary on terrorism and gun rights? Is there a single Democrat in America who’s going to take Obama to task for his politically driven anti-gun “reaction” speech on Sunday? The sad reality is that events like Orlando need to be politicized and reacted to quickly because of the incredibly short attention spans of the American public. We’re only a little over half a year removed from the San Bernardino (California) mass murder perpetrated by Islamic radicals and already the public seems to have moved on and accepted such things happen in far off places. It’s a nationally collective case of out of sight, out of mind. Yay Hillary! She’s a woman! She’s the first female major party nominee! Who cares if her open border immigration policy will result in more terrorist attacks, she’s a she! Would it have pacified Trump’s critics if he’d observed an appropriate “waiting period” to respond to the Orlando attacks? 36 hours maybe… or is 24 enough? Donald Trump may not be the most tactful person in the world, but we already knew that. Twitter is an instantaneous way for anyone to comment on current events. It’s not like you can delay a tweet. Besides, people like Trump because he fights back. If you want someone who will tread lightly and sidestep an issue to death, there’re more than enough choices to go around, including Republicans such as Paul Ryan. They’re the ones who will weigh the reaction from all sides and carefully tailor their words accordingly. If you want the blunt truth, Trump will provide it. Politicians like civil drivel, but the People want the straight facts…and Trump is smart enough to know where his political bread is buttered. As one of #NeverTrump’s potential White Knight candidates (or even a Trump running mate), Marco Rubio still has a loose connection to the presidential race. But I’ve also argued Rubio’s recent warming to Donald Trump might have a deeper political motivation, namely his secret plans to get back into the Florida senate race. Call me skeptical, but the Orlando attack is all about politics where Rubio is concerned. Just like it might have given #NeverTrump the means to crawl out of their prison cell and get behind Trump now, it also provides Rubio the perfect justification to reenter the fray. In the interview with Hewitt, Rubio further added he would “pray” on it and decide how he might best serve in the future. I’m not sure if his phone line leads straight to God, but here’s guessing Marco will see a divine sign in his mind that proves he belongs in politics. His best means to remain connected to his legions of adoring establishment fans is to stay in the senate. I guess we’ll know within two weeks what the almighty told Rubio to do. Finally today, in a move that’s certain to set off both the PC police on the Left as well as the weak-kneed hyper sensitive #NeverTrump forces on the other side of the spectrum, Donald Trump delivered a national security speech on Monday and didn’t see the need to mince words. Jonathan Easley of The Hill reports, “In a pivotal speech for his presidential campaign, Donald Trump on Monday blamed lax immigration laws and political correctness for the deadliest mass shooting in U.S. history. In the address, Trump went directly after both Obama and Hillary, naming names and pointedly blaming them for the policies that have led to terrorism in the country. Debate will continue on the merits of Trump’s claims. But one thing is beyond dispute: where Donald Trump is concerned, you’ve got a candidate who will not be the least bit afraid of saying to your face what he would behind your back. Political nicety is out the window. Some people love it, some hate it. But there’s never any question where The Donald stands. Submitted by email_registrat... on Tue, 06/14/2016 - 15:13. The establishment is trying to oppress Trump. They are only in it for themselves and the money. They are totally anti-constitution and have brought this country to it's knees. Walker just announced his support for Trump which is good news. Now only if others would realized what is going on in Washington but they are all benefitting from the games that are being played and that is to totally destroy America..